The upcoming Dubai Expo 2020 has sparked fresh optimism in the UAE automotive aftermarket, with international manufacturers gearing up for new business opportunities as final preparations fall in place ahead of the global mega event. The Middle East’s first ever World Expo is expected to attract more than 25 million people from across the globe, while a price tag of at least US$9 billion suggests the host Emirate is pulling out all the stops to create state-of-the-art facilities and infrastructure. With US$3 billion worth of venue-related construction contracts awarded in 2017 alone, the increase of commercial and heavy-duty vehicles along with cars is expected to effect a corresponding rise in demand for spare parts and accessories, tyres and batteries as well as a host of maintenance and upkeep-related infrastructure and services. The business potential has injected new impetus for international players in the automotive services industry, with more than 1,900 from 57 countries preparing to showcase their latest products and services at the 16th edition of Automechanika Dubai in 2018. Companies exhibiting at the three-day event, which takes place at the Dubai International Convention and Exhibition Centre, are targeting large-scale business growth up to, and beyond the six-month global showcase. 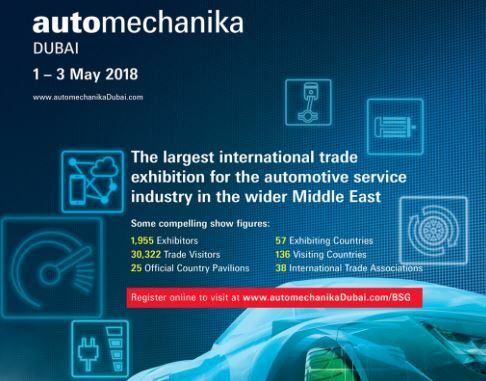 Organised by Messe Frankfurt Middle East, Automechanika Dubai is the Middle East and Africa’s largest exhibition for the automotive aftermarket and services industry. Automechanika Dubai 2018 spreads over six product sections of Parts & Components; Electronics & Systems; Accessories & Customising; Repair & Maintenance; Car Wash, Care & Reconditioning; and Tyres & Batteries. Ahmed Pauwels, CEO of Messe Frankfurt Middle East, said: “Mega events such as the Dubai Expo 2020 do have a multi-sectoral impact on the region with the increase in expenditure for new infrastructure, support systems, logistics and commercial facilities. “The impact is reflected among exhibitors at Automechanika Dubai 2018, many of whom are anticipating an injection of aftermarket products and services demand, with the expected rise of vehicle parc. It may also favourably impact Dubai’s total auto parts trade in the coming years, which in 2016, was worth US$10.6 billion,” Pauwels added. Automechanika Dubai’s global influence is highlighted by the presence of 25 country pavilions and 36 international trade associations, while 90 per cent of exhibitors, and 52 per cent of the 30,000-plus visitors are expected to come from outside of the UAE. The annual showpiece will return with its popular Truck Competence initiative, where more than 1,500 exhibitors will showcase their products dedicated to the entire value chain in the truck sector, from truck parts and accessories, to workshop equipment, body repairs and care. It will also feature the popular Automechanika Academy – a series of seminars, presentations, and workshops about key issues and regulations that affect the automotive aftermarket, and the African Buyer-Seller Meet, connecting suppliers with buyers from the world’s second largest continent.